‘Mind the Gap, please’ on RFID tracking - Nothing to Hide? This never seemed a more appropriate turn of phrase to what has just been posted. A change in US law over ‘malicious’ RFID tracking has been accompanied by a ‘press release’?! Consciences appeased indeed, however loop-holes are not – and plays right into the hands of the retailers. When this law goes into effect in Washington in July, anyone caught scanning a person remotely “without his or her knowledge and consent, for the purpose of fraud, identity theft, or some other illegal purpose” will be charged with a Class C felony. However, the original bill carried a consumer’s “opt-in” in order to force retailers to have to ask your permission before they were allowed to track your purchases linked to your loyalty card, but mysteriously dropped from the final bill. Corporate squeeze behind the scenes at the Whitehouse no doubt. It has certainly ruffled a few feathers over in the US. 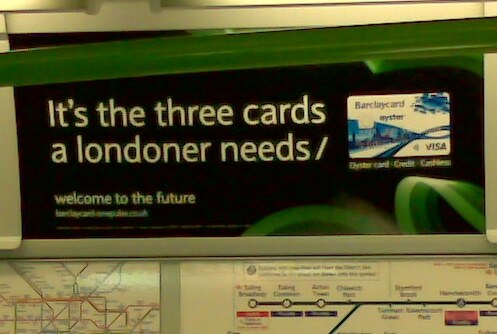 Then again, did anyone ask my opinion across the pond here in the UK when they changed the London Transport system to RFID-enabled Oystercard? Thinking about it I didn’t see any huge protests on Whitehall about this back-door ID card being rolled out. All very stiff-upper lipped and British-like. In fact, instead of a loyalty program rewarding me for being tracked like the supermarkets offer, Transport for London (TFL) hike up cash-fares and make it damn inconvenient for me to do anything but ‘opt-in’, and in doing so force me to be tracked – and we get a marketing campaign of ‘faster, smarter, CHEAPER’ to boot – along with CCTV everywhere all over the underground apparently ‘for my safety’. Still, you can always not register the card; always top it up with cash; and keep it wrapped in tin-foil in your wallet when not-in-use… oh and I guess wear a balaclava for the CCTV cameras. After all, being innocent till proven guilty you have ‘nothing to hide’, right? [one thing] a Londoner needs’ right now. This is getting totally out of hand. I can’t believe the things happening in supposedly “free” countries. I thought things were getting bad here in the U.S. until I started hanging out in smokers’ rights forums where everything is watched. I started checking all the links to different articles and sites others posted and was appalled to see that the citizens of the UK were so “watched”. Seems George Orwell’s fiction, “1984”, was really insight on his part. He just got the year wrong. I miss the world I was born into and want it back again.